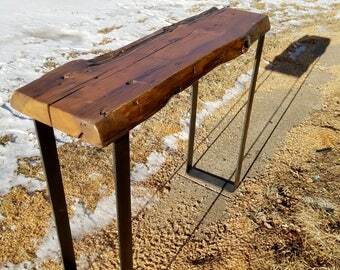 Hairpin leg reclaimed wood console table, narrow sofa table, or entry table. Custom lengths and heights available. Urban farmhouses meets mid century modern. Made from authentic, hand-hewn, salvaged wood from century old barns and cabins in the upper Midwest. 2) Choose your table height from the drop down menu. 3) Choose your finish color. Make a note in the comment section of your order to request your desired finish. The standard finish depicted in the primary photo is called vintage maple, which plays beautifully with the natural variations of the wood. I am happy to custom mix a shade to work with your own furnishings, floors, woodwork etc... Please inquire if interested. 4) I want your table to be the perfect fit for your home. Do not hesitate to contact me with any questions or special considerations before ordering. The footed hairpin legs will accommodate felt pads in order to protect floors or to help with leveling on uneven floors. The leg standard color is black. Dark bronze is also available. American made by our production partner, US LEGS. 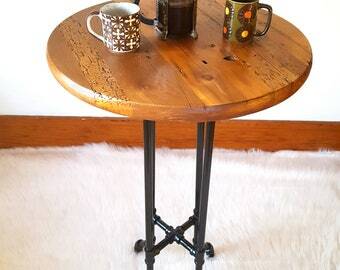 Domestic Shipping for tables under 90" is now always $76. Use them as benches or tables, window seats or end tables. We also offer a wider version, see Related Products below. coffee table with hand hewn edges - https://www.etsy.com/listing/242452614/coffee-table-reclaimed-barnwood-beams? floating shelves from hand hewn lumber - https://www.etsy.com/listing/492897885/floating-shelves-natural-edge-reclaimed? 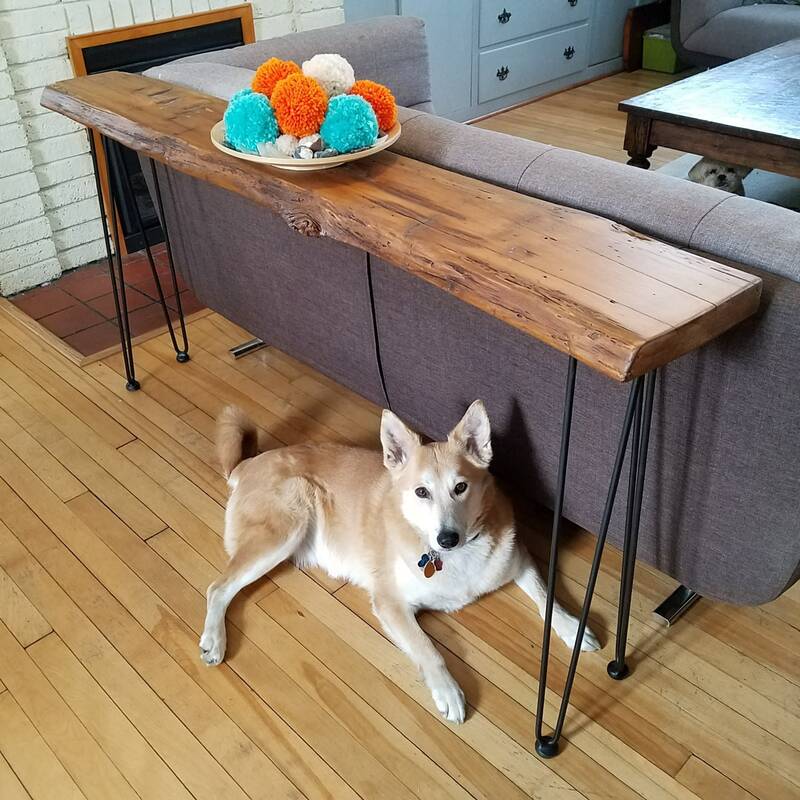 Reclaimed Wood Console Sofa Table with Hairpin Legs - Ready to Ship! My wife and I are very happy with the purchase. I would have no problem buying something from SpokenWoodDesign again. It was a pleasure to do business with Chris. We sent photos of other wood furniture (we own) & he was very helpful in advising about stain color & leg style. We are delighted with our sofa table customized to the size we need! Love it!!! It’s exactly as we expected it, beautiful table! It is perfect for the space, exactly as I imagined. Thank you so much!